On January 9th, Goodreads made the switch to a new giveaways system where authors have to pay to play. This could be bad news for readers as well as for authors. Now, you may be thinking: Okay, I love Goodreads. And there are free books involved? What’s the problem here? Well, there are several issues. First of all, with the standard giveaway format costing $199 for a single giveaway, and the premium version swallowing up $599, the number of books available on the giveaway platform is about to take a nosedive. Fewer books = bad. No arguments here. Second of all, all entrants must be U.S. residents, even for ebook giveaways. Gross. And unfair. So the face of Goodreads Giveaways is changing, big time. Just a few months ago, it was a great spot for indie authors to show their wares. This was a huge benefit for ravenous readers of the more prolific genres, like romance, many of whom gladly go from traditionally published books to indies and back again without thinking twice. Now Goodreads is another platform where the biggest spenders literally come out on top. 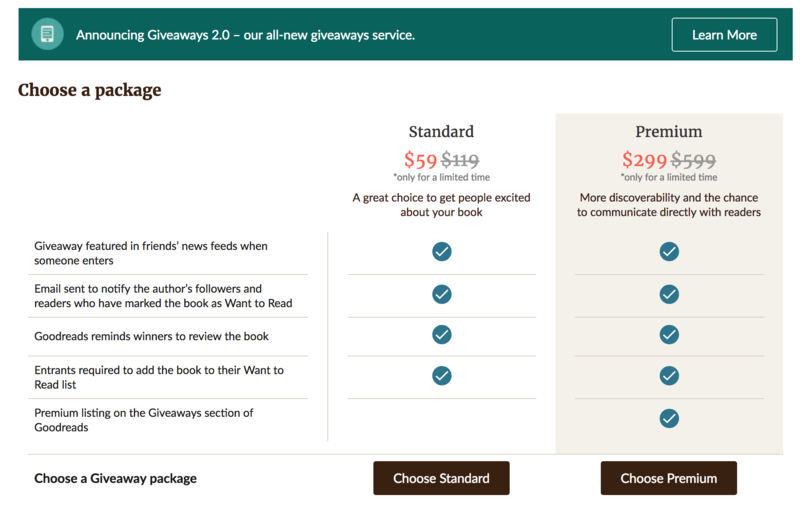 What changes will readers see to their beloved Goodreads Giveaways? For non-U.S. readers, you’ll see a lot of giveaways that you can’t enter. Everyone will see a major downturn in the number of books being given away. Readers will be required to put the books on their “want-to-read” lists. Will this screw up your lovely shelf organization? Only time will tell. On the bright side, authors can now giveaway up to 100 books at once! Goodreads Giveaways is becoming a much more corporate platform *cough* Amazon *cough* so I guess the reader won’t totally lose out.